We were just blown away with all of the submissions to our Canada Learning Code Week Most Innovative Project Contest, presented by Amazon’s Future Engineer Program! Take a look at some of our award-winning projects! Working with our Self-Driving Car lesson, students built their own racing games using Scratch, flexing their problem solving skills and working together to overcome challenges. Give their game a try here. 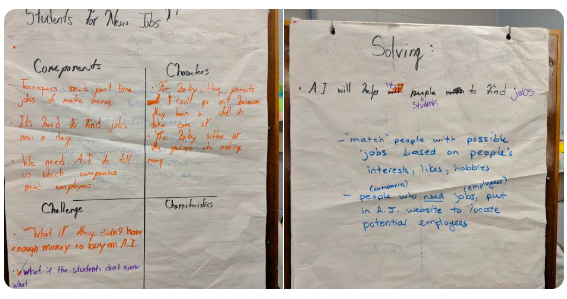 Using our “Alexa, how might we…?” lesson, students came up with solutions to helping young people find jobs that match their interests using AI. Take a look at how they formed problem statements and worked together to build interesting solutions. While exploring our Self Driving Cars lesson, a student in Mr. Hennigar’s class took her place in the driver’s seat – helping her classmates understand how the sensor code worked, and how they could make additions/changes to customize the car’s program. Take a look here. These are just some of the incredible entries we received and all of the projects we saw shared over social media during #CLCCodeWeek. Thanks to the over 1800 educators and 88,800 students who brought code into their classrooms and communities (and a special thank you to Amazon’s Future Engineer Program for making this contest possible)!